To understand Sinus Tarsi Syndrome, it is important to know a bit about the anatomy of the foot. The Sinus Tarsi is a bony canal inside the rear part of the foot. It runs roughly crossways (like left to right) just in front of the outside ankle bone. If you feel that area, you will find a deeper spot where you can push your finger further inwards than in the bony areas that surround it. The canal is formed by two ‘half-pipe’ like grooves carved into the bones that meet there. The Talus Bone on the top and the Calcaneus or heel bone on the bottom. Inside the canal is a ligament, blood vessels, nerves, fat and some gristle-like tissue that binds the bones very tightly together into a joint. The joint is called the Subtalar Joint. This joint sits ~3 cm below the ankle joint. Importantly, where the ankle joint can only move in one plane (up and down like a nodding head), the subtalar joint is where your foot can move in every plane. This allows it to make circular rotations and to cope with uneven terrain underfoot. In true sinus tarsi syndrome, the tissues in the canal will show signs of chronic inflammation. This includes cellular damage and fibrosis, an overgrowth of tissue similar to scar tissue. A tear of the ligament that binds the Subtalar Joint together. This could result in too much movement between the bones in an uncontrolled way. Damage to the cartilage of the Subtalar Joint. This is known as an osteochondral defect. Injury to the Subtalar Joint, especially from a wrenching injury that strains the tissue that binds the bones together. Degenerative disease of the subtalar joint. Commonly, Osteoarthritis. Long term inflammation of the soft tissue within the sinus. What are the signs and symptoms of Sinus Tarsi Syndrome ? Pain will be felt in the location of the sinus tarsi. This runs across the foot near, below the ankle bones as described above. Walking on uneven ground is usually painful. There is often there is a history of ankle injury. The pain is usually worsened by standing on the feet and tipping the soles inwards – like a sprained ankle position. A reliable way to diagnose the condition is to inject local anaesthetic into the canal. This is a diagnostic test – not a treatment – as the reduction in pain only lasts a few hours. X rays of the joint are often normal if the cause of the pain is one of the soft tissue injuries. Bony injuries such as degenerative arthritic disease or tarsal coalition should be visible on X Ray. It can be difficult to get a good view through the subtalar joint at the Sinus Tarsi. An X ray view known as a Harris and Beath is the best plain image. MRI is the investigation of choice and will show the soft tissue conditions well if there is significant inflammatory and fibrotic changes. It also allows a good view of the cartilage and bone components inside the joint. These can be difficult to assess on plain x ray as the joint’s curves make it difficult to get a good shot ‘through’ it. How do you treat Sinus Tarsi Syndrome ? Treatment would usually start with a thorough assessment of the nature and the degree of the injury. Milder problems can usually be well treated by providing mechanical support to the foot, such as an orthotic. We would aim to control ‘bad’ movements in the Subtalar Joint and address poor function of the tendons around the ankle. If the condition has been present only a short time and might be transitory, pain killers and anti-inflammatory tablets may help. If not Sinus Tarsi Syndrome, what else might it be ? It would be fair to say that true Sinus Tarsi syndrome is quite uncommon. There is, however, a very common complaint that creates pain in the area of the Sinus Tarsi that is not the condition described above. 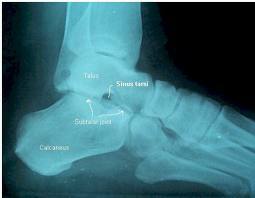 The Subtalar Joint, which contains the sinus tarsi canal, is a complex joint with three articular facets. This means that three pairs of cartilage coated, bony areas rub together during each part of the joint’s movement. The bottom bone is shaped a bit like a horse’s saddle and the top bone is equally contoured in the reverse way. It is difficult to imagine this particular joint at work because it moves in such a unique way. However, this idea of the concept will help to understand this other condition of Subtalar Joint strain. Imagine that you went to the gym and picked up a heavy hand weight. If you did bicep curls the right way – without straightening the elbow all the way out – the session should pass without incident. Imagine that instead of this, you flung your arm straight out, at speed, until your elbow joint was forced to stop the movement because you have reached the point where bone hit on bone. You can see that you would hurt yourself. This is a good analogy for what happens in the Subtalar Joint. If your foot posture and function is bad, you might not be working in the middle of the range of motion of the Subtalar Joint. You work be working at the end of your possible range, just like the elbow discussed above. A bad foot position will almost always mean pronated / flat footed, rolled in feet. Each time you hit the end of range, it ‘pinches’ the joint on the outside edge and causes pain in the region of the Sinus Tarsi. Over time, the joint can develop serious wear and tear or osteoarthritis. This is known as Lateral Subtalar Joint Impingement. Lateral Subtalar Joint Impingement has a lot in common with Sinus Tarsi syndrome, but is earlier, milder and more treatable. The treatment is quite simple, non surgical and has very good rates of success. As with all degenerative conditions, the earlier the treatment is commenced, the less damage has time to build up. If you think that you have an issue with this, or any other foot condition, call us today. Wouldn’t it be nice to Walk Without Pain?